The September 7, 2018 release brings together legendary artists to present the symphonic music of George & Ira Gershwin in unprecedented sonic scope. 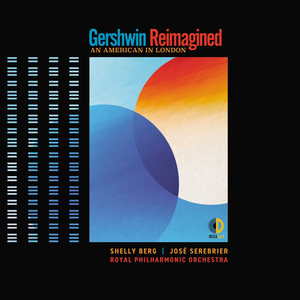 Five-time Grammy-nominated pianist Shelly Berg, multi-Grammy-winning conductor José Serebrier & the Royal Philharmonic Orchestra are joined by a group of legendary guest artists who have come together for the Universal /Decca Gold release Gershwin Reimagined – An American in London, set for a September 7, 2018 release. The landmark album, produced by eight-time Grammy Award recipient Gregg Field, features Grammy-winning artists Mark O'Connor and Arturo Sandoval, Grammy-nominated vocalists Monica Mancini and Ledisi and the Shelly Berg Trio. Field noted that recording classic Gershwin material that has been covered so often required a fresh take and contemporary point of view. "When Shelly approached me about the album, I was initially hesitant due to the sheer volume of existing Gershwin recordings. We discussed how we could present Gershwin in a unique way that that takes into consideration contemporary musical tastes and recording techniques. We let that guide us in the creation of the album." Early on at the initial tracking sessions, Berg, along with conductor Sererbrier and the Royal Philharmonic, found magic while recording at George Martin's Air Lyndhurst Studios in London. From the first rehearsals Sererbrier challenged the orchestra and soloists to take chances and make the music their own. They clearly took that to heart. Also notable is the choice to record and mix the album incorporating techniques used more in contemporary orchestral film scoring. The results revealing musical details inside Gershwin's orchestrations not heard in traditional orchestral recordings. "I'm hearing inner orchestration detail that I've barely heard or not heard at all on previous recordings," Berg noted. The album opens with "Rhapsody in Blue" and Sererbrier and Berg's masterful command of Gershwin is on full display. From the joyous clarinet glissando opening to the album's debut of the Shelly Berg Trio morphing and improvising in and out of the original Gershwin piano cadenzas, "Rhapsody in Blue" with "Jazz" variations seductively portends what's in store on this unique album. Second up is the classic "An American in Paris" and once again the magic is not only in the RPO's inspired performance, but this edition features the original and rarely heard Ira Gershwin lyric "Home Blues," written for the original 1928 composition and performed here by Berg and the twelve-time Grammy-nominated singer, Ledisi. Berg and Ledisi take us on a journey down a street and into a Paris nightclub of the '20s where one might find Josephine Baker and Fats Waller. Berg utilizes the iconic Abbey Road "Challen" upright piano to help authentically deliver Ira's lonesome American expat's story. The third track explores the Gershwin opera Porgy and Bess with a medley of "I Loves You Porgy" & "My Man's Gone Now" featuring Monica Mancini and Arturo Sandoval. The musical arrangement was originally created by multi-Grammy recipient and Pulitzer Prize nominee Patrick Williams for Mancini's L.A. Philharmonic production of Gershwin at the Hollywood Bowl. Mancini and Sandoval reach deep into the emotional Williams arrangement and deliver a compelling recorded performance. Williams' untimely death in July of 2018 will leave this arrangement as one of his last recordings. Lifting the spirits, the fourth track "Fascinating Rhythm" features virtuoso violinist Mark O'Connor and the Shelly Berg Trio. O'Connor, a three-time Grammy recipient, has won acclaim for his Billboard #1 classical collaboration, Appalachia Waltz, with Yo-Yo Ma and Edgar Meyer. O'Connor's cross-genre talent is on full display here as are Berg's formidable improvisations that playfully trade with O'Connor and the RPO. The penultimate track "Three Preludes," originally composed by Gershwin as three short solo piano pieces, is masterfully orchestrated for the RPO by the eight-time Grammy recipient Serebrier. Berg and Field add a playfully improvised preamble to "Three Preludes," merging genres and continuing the reimagining of Gershwin throughout. To close the album, Berg chose variations on "I Got Rhythm," presented here as the complete symphonic version and expanded to feature the Shelly Berg Trio. Berg's ability to easily move between the symphonic orchestration, creating piano and trio improvisations around the themes, is unique and compelling. Gershwin Reimagined – An American in London is a compendium of all things Gershwin, rooted in its original symphonic and jazz origins, then reimagined at every level for the contemporary music fan, all the while capturing the timelessness of Gershwin.